Closed: Mondays (following day in case of pub. hol. ); 3rd Thursday (4th Thursday in case of pub.hol. ); December 29 thru' January 3. Red bricks, white granite, now-green bronze plates and black slate give the building an appropriately dignified yet somehow spectacular neo-baroque exterior, and also serve to bring out the best in the overall vista of the surrounding area, making the City Archives building one of the most impressive symbols of the region. Given its historical background and architectural beauty, the people of Nagoya pushed strongly for protection for the old courthouse as an invaluable cultural asset for the city. 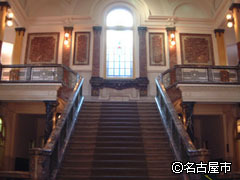 These efforts were rewarded in 1989 as Nagoya City, with help from the national Cultural Agency and Aichi Prefecture, carried out restorative and preservative work on the building, reinventing it as the Nagoya City Archives. 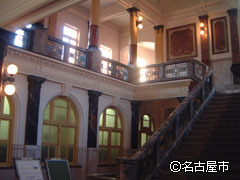 The building was also designated as an important national cultural asset in 1984; it is preserved and open for the public to enjoy as well as to display Nagoya City痴 official documentation, administrative papers and materials, highlighting the history of Nagoya City from its inception up to the present day. 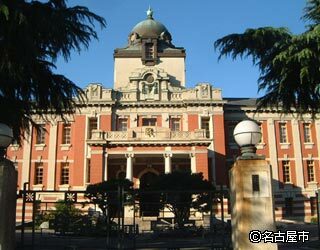 There are also conference, meeting and exhibition facilities, making the Nagoya City Archives a true forum for the citizens to gather. <City Bus> 5 minutes' walk from "Shisei Shiryokan Minami "
<Subway> 8 minutes' walk from "Shiyakusho"
<Meitetsu Train> 5 minutes・walk from "Higashi Ote"